Are they ready to move up?? In another month they will be off camping and hiking by themselves. Enjoying the outing in Scouting and learnoing to Be Prepared!! Just 3 or 4 years until eagle and Philmont!! Will they stay the course and succeed?? Let the boys talk about what's going on in school. Don't try to change any of their ideas, but guide the discussion in such a way that they will see the value of an education. Learn about the history of education, how schools developed in America. Prepare a chart of the school system and explain and discuss with boys. Discuss & do a den service project for the school. Invite the parents of Webelos to come to a den meeting dressed in the type of clothes they wore to school. Have them bring along such things as class pictures, yearbooks, report cards, etc. and allow each ample time to share his/ her school days with the den. Have a panel of parents with various jobs explain their schooling and training for these jobs. Invite an educator to talk with the den about some of the scholar requirements. As a den, talk about good study habits. Have someone from the public library talk about the local literacy project. Tour a local high school or visit a local college campus. Play a Newspaper Search game looking for articles about education. Encourage boys to find out all they can about schools in your community ... the different types and how they work... the problems and opportunities. Discuss these at a den meeting. Have the boys make a list of the things they like about school and another list of the things they don't like about school. Give these lists to the principal. Have the boys make a daily time schedule and use it to determine if they are making the best use of their time. Have each boy choose one career in education and think of what may be involved in that career. Have them make a collage of pictures that relate his ideas about that career. You may be surprised at a Webelos Scout's perception of some of these jobs. When done, discuss them and clarify any misconceptions. Invite a member of the school board or a professional educator (teacher or principal) to talk to the boys on the value of an education and what school has to offer a boy. What jobs are there at school for the boys to do? What community activities is the school used for? Who are the people on the office staff, cafeteria staff, and custodial staff? What are their responsibilities? What are some of the problems of the school, and how can you help? Have the boys list what they consider the best and worst things in their school. Arrange to give these lists to the principal or a school board member. Invite them to a den meeting to talk with the boys. Important to the participants in such a meeting is a feeling of trust and comradely. Allow the meeting to have an informal setting. After respectfully introducing the guest, let it become an informal rap session. A few cookies and punch served by the Denner has worked wonders in the past. Now is the opportunity for the leader to blend into the woodwork and enjoy observing. Do not become concerned with a lack of participation on the boys' part. If the guest is someone concerned with the boys of this age group, he or she will draw them in. A little more informal would be a meeting at school between the boy and a teacher. Have the boy list questions and set up approximately 10 minutes to meet. Have the boy discuss his meeting at a den meeting. Plan a trip to the library to have the librarian demonstrate the use of a microfilm or microfiche viewer. Ask a librarian to explain the Dewy Decimal System or Library of Congress system, visit the public library, and have boys complete applications for library cards, if they do not already have one. Briefly visit a school board meeting. Let them know you are coming. They may be interested to know the boys are working on the Scholar Activities Badge. Print large letters on 5x8 index cards, one letter per card. Do not use the letters J, K, Q, V, X or Z. Make several cards with vowels on them. Have a card for each person in the group. On signal, the Cubs hold up their cards, then rush around to find two other people with letters that when combined with theirs, makes a valid 3-letter word. They must lock arms, in order and rush to a judge who writes their word on the back of their card if the word is valid. Then they separate and each rushes to find two more letters to make another word. Play continues for 5 or 10 minutes. The winner is the person with the most words on his or her card. Have the boys discuss what they think school will be like 25 years from now. Will the students all be at computers? Will they interact with teachers from a TV hookup from their homes? Will they travel to Mars for math and Saturn for science? Will someone have invented a smart pill for every subject? In the future, will we do away with some of the subjects that are taught now? Which ones? What new subjects might be offered? Divide them into groups to make posters of their view of education in the future. Learn to Listen - Look at the speaker, concentrate on his words, take notes, participate in discussions. Develop Good Study Habits - Avoid distractions, have supplies handy, do homework at the same time each day, make a list, do the things you hate first, schedule a short break if needed. Use the Right Reading Technique - learn to skim by glancing through whole paragraphs at a time; use slower, more careful reading when you must understand and remember. Improve Your Vocabulary - look up words you don't know, write them down, use the word(s) in your next conversation. Sharpen Your Writing Skills - brainstorm for ideas, organize your thoughts, keep sentences short, use neat handwriting, double check spelling and punctuation. Learn How to Take Tests - study well ahead of time (don't cram), relax, then face the test; read the directions carefully; answers questions you know for sure, pace yourself, work steadily; go back and fill in missing answers as best you can; double check your work for careless errors and omissions. Develop a Positive Attitude - you are what you think you are - use positive thinking! Education reflected and participated in the development of “The American Way.” American History was instituted in schools during this time period. Education became more secular in nature, and states enacted laws requiring compulsory school attendance. Resources were limited and physical demands left little room for education. Education was initially established for religious motives (Puritans in New England.) Most education of this period was either in the home or apprentice training. Nine colleges were formed during this time period. Enrollments in elementary and secondary schools were above 90% of the eligible students. Wide inequities developed between states and local school districts. America’s schools have developed as the nation has advanced. As the population became more concerned with technology and material progress, education progressed in turn. Education was influenced by European immigrants and travel to Europe. Secondary education replaced the academy and public high school became a reality. Three practices of education were established during this time: 1) Compulsory education, 2) Public support of schooling, and 3) Three levels of education (elementary, secondary, and higher) were set up. This was the beginning of a movement toward state school systems. Establishment of the elementary level was completed. Secondary education was taken care of through academy training. Numerous new colleges were started in the early nineteenth century. Colleges increased their courses and programs. Teaching grew more toward a profession and teachers became concerned with a methodology of education. School efforts have been structured towards quality education; while the size of the education system increased in size greatly. In schools the vocational education program diversified its offerings, while general education was considered a preparation for earning a living. Schools began to look more toward the students vocational pursuits. Can You Follow Directions Test? 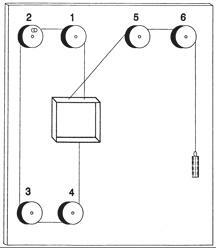 This test is to see if you can follow directions. Concentrate, but remember, you have only two minutes to complete this. Put your name in the upper right-hand corner of this paper. Circle the word "name" in sentence number 2. Draw five small squares in the upper left-hand corner of this paper. Put a circle around each word in sentence number 5. Put an "x" in the lower left-hand corner of this paper. Draw a triangle around the "x" you just put down. If you think you have followed directions up to this point, call out "I have." Now that you have finished reading this carefully, do only number 1 and number 2. You have finished. How did you do? You are the captain of your very own scholar-ship (learning). Teachers and parents can help, but how well you do in school depends greatly on how well you do your homework. School has just started. Imagine that your scholar-ship has just left port for a nine-month cruise. You will decide how smooth the trip is going to be. You will set your goals and chart your own course. Before your scholar-ship really gets under way, it's a good idea to check your skills to find out where you need to improve. You'll want to get your scholar-ship into shipshape. Draw a face that would show how well you think you use your study skills. Lifestyle - Do you allow enough time for sleep, rest and fun activities? Assignment - Do you keep up with and write down your assignments? Schedule - Do you set aside time to study? Place - Do you have a good, quiet place to study? Organization - Do you organize your study area? Focus - Do you keep your mind from wandering by remembering your study skills? Review - Do you ask yourself questions or have your parents ask you questions to make certain you understand what you have studied? boys. Recruit the help of a parent who is an engineer. One of the purposes of Cub Scouting is "fostering a sense of personal achievement by developing new interests and skills" in boys. This activity badge probably does this more than any of the other badges. Engineering is one of the most exacting of the professions and the badge includes projects that will give a boy an insight into some types of engineering. Arrange for boys to visit an engineer or surveyor in a municipal county office. Plan for the boys to look through the surveyor's manual and read a rod. Visit a construction site and see the plans which are being followed. Visit the County water works, TV or radio station. Have someone explain how to read topographic maps. Have a builder or carpenter show and explain a floor plan of a house. Make a block and tackle. Be sure to explain its purpose. Make catapults and demonstrate them at pack meeting, shooting candies or marshmallows into the audience for distance. Discuss property lines. Have a surveyor show how property lines are determined and measured. Discuss different types of engineers. If one can visit your den, let him describe briefly what his duties are. Have boys collect pictures of bridges and note the differences in construction. Take a field trip to an operating draw bridge (ex. St Croix River), ship loading operation or other large industrial operation involving large cranes or other lifting equipment. Aeronautical Engineering: Deals with the whole field of design, manufacture, maintenance, testing, and the use of aircraft both for civilian and military purposes. Astronautical Engineering: Closely related to aeronautics, but is concerned with the flight of vehicles in space, beyond the earth's atmosphere, and includes the study and development of rocket engines, artificial satellites, and spacecraft for the exploration of outer space. Chemical Engineering: Concerned with the design, construction, and management of factories in which the essential processes consist of chemical reactions. Civil Engineering: Perhaps the broadest of the engineering fields; deals with the creation, improvement, and protection of the communal environment; providing facilities for living, industry, and transportation, including large buildings, roads, bridges, canals, railroad lines, airports, harbors, and other constructions. Electrical Engineering/Computer Science: Divided broadly into the engineering of electrical power distribution systems, electrical machinery, and communication, information, and control systems. Geological & Mining Engineering: Includes activities related to the discovery and exploration of mineral deposits and the financing, construction, development, operation, recovery, processing, purification, and marketing of crude minerals and mineral products. Industrial or Management Engineering: Pertains to the efficient use of machinery, labor, and raw materials in industrial production. Mechanical Engineering: Broadly speaking, covers the design and operation of all types of machinery and small structures. Safety Engineering: Concerned with the prevention of accidents. Sanitary Engineering: A branch of civil engineering that has acquired the importance of a specialized field due to its great importance for a healthy environment, especially in dense urban population areas. Research: A search for new scientific knowledge, with the objective of applying it to solving problems. Development: Applied research which results in working model. Design: Conversion of developed ideas into economical, reliable, and producible plans of manufacture, use or construction. Maintenance: Plan and direct the methods of making the design and transforming it into a useful product. Sales: Define and explain the application of the product and the sale of it. Management: Administrate any or all of the engineers which perform the functions listed above and any other personnel required to perform the assigned task. Visit (with permission) a housing project or a commercial building construction site, possibly in conjunction with a visit by an engineer as a guest speaker at your meeting. There are many big engineering structures around our country – dams, bridges, towers, sewerage plants, buildings, stadiums, power plants … Many times you can get an inside tour of these structures that would fascinate your Webelos. However, I am not sure how many have stopped (Like the Delaware Memorial Bridge near me) after September 11. Many times there are even visitor centers near the structures explaining how they were built. I never tire of seeing Hoover Dam constructed in 22 minutes on the screen in the museum in town. The Corps of Engineers office at Clinton Lake, west of Lawrence, Kansas, has a display on the building of the dam at the lake and how a dam works. Maybe you could combine some of these trips with a fishing trip or nature hike at the lake made by the dam or a nearby state park. From the Heart of America bridge (Locust going north over the Missouri River), to the east you can see a classical suspension bridge carrying I-35. Also known as the Paseo bridge. West from the Heart of America bridge you can see two truss bridges of different design and then the Broadway bridge which is a suspension bridge suspended from arched girders. Further west, an arch bridge goes over 7th Street just north of I-35. The 12th Street bridge over the Kaw River is especially interesting. The first span as you proceed north is a plank bridge, the next three spans are classical cantilever, and the last is truss. Any number of pier type bridges can be seen in the area. The majority of the bridges used in the Interstate systems are of this type. Be sure to notice that while the bridges are pier type, the piers themselves are sometimes cantilevered from side to side across the roadway. In a 5 mile section of Delaware SR 1 between Smyrna and Dover in Kent County, Delaware, there are seven bridges. Two bridges are dual, single-span steel beam bridges. Three bridges are two-span, steel girder bridges. The remaining two bridges are dual, multi-span, pre-stressed concrete girder bridges. I am sure, the more you look at the bridges around your area, the more you'll realize that there are few pure one-type bridges. 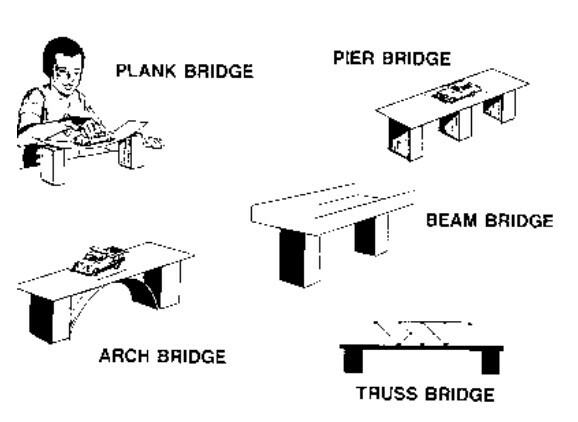 Most are bridges that incorporate several design types in one. For instance, many pier type bridges over the railroad tracks are arched to provide strength while conserving materials. Nail Thread spools loosely to board, sip string over 1,2,3 and 4. Wind string several times around 2. Wind second string over 5 and 6 and attach weight for balance. Turn handle on 2 to move car up and down.